The rich history and resources of civil resistance – and its many examples of success – offer some hope for progress even in the dire conditions of Palestine. 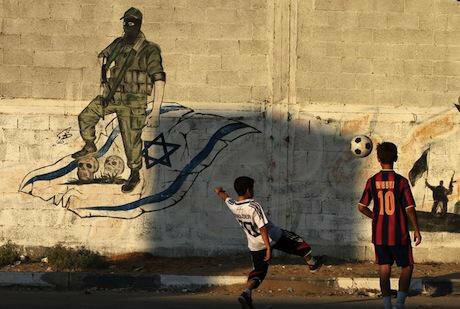 Palestinian boys play football in front of anti-Israel graffiti, Gaza City, 2011. Demotix/Majdi Fathi. All rights reserved.The eruption of conflict in Palestine is described by some as "the third intifada", using the term for the prolonged uprisings against Israeli occupation in 1987-93 and 2000-05. Whether that designation proves premature, the rapid increase in violence, especially in Jerusalem, appears to have surprised Benjamin Netanyahu's government. The latter's extraordinary comments about the trigger for the Nazi genocide, made during a visit to Berlin, is an indication of this confusion. From the perspective of that government, and given the far superior resources of and levels of control exercised by the numerous Israeli security-force agencies, the current resistance should simply not be happening. And yet it is. Where are the ingredients of protest in this situation, including the often neglected non-violent kind, and where might such protest lead? For those seeking serious thought and analysis on these questions – including Israelis, Palestinians and others – two timely new books offer greatly valuable insight. One focuses specifically on Palestine, while the other examines the wider issue of non-violent change. The first is written by Andrew Rigby and Marwan Darweish, two academics at Coventry University: Popular Protest in Palestine: the Uncertain Future of Unarmed Resistance (Pluto Press, 2015). More than two decades ago, Rigby wrote a highly perceptive analysis of the first intifada: Living the Intifada (Zed Press, 1991), and this latest meticulous study extends a long-lasting engagement. Indeed, the work benefits from the co-authors' years of research as well as excellent contacts in Palestine and Israel. The focus is primarily on the West Bank, with study of numerous local movements stretching across the West Bank from north of Jenin to south of Hebron. The numerous examples of non-violent resistance are chronicled, with due attention paid to the great dangers often faced by activists. Darweish and Rigby weave many other elements of recent history into this narrative of enduring resistance. Among them are the varying effects of international support for Palestinian independence. The book was written well before the current upsurge of violent confrontation, but that makes it even more of an asset. For in mapping the pressures placed on so many Palestinian communities under occupation, it clearly explains why some young Palestinians – as in the latest outbreak – are led towards a more violent reaction. 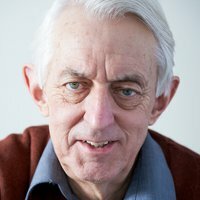 This hugely informative work begins with a short but very useful discussion of approaches to non-violent social change. It is admirably hard-headed in relation to the limitations of this approach, yet still sees prospects for success in many environments. This theme is developed by the second, and equally remarkable book: A Guide to Civil Resistance: A Bibliography of Social and Nonviolent Action (Green Print/Merlin Press, 2015). This is a companion volume to one published in 2013. Both deserve to be on the shelf of – and regularly consulted by! – any student of social change. Volume 2 follows a similar pattern: again framed as a bibliography, but in truth providing a window on a whole world of change rooted in non-violence. This time the emphasis is on more broadly based movements concerned with the environment, social justice, peace and many other processes (see "Chances for Peace, the second decade", 20 December 2012). Once more, the book combines over 800 references with thoughtful essays that connect the various themes, including a particularly valuable section on preparation and training. Both volumes are permeated by a sense of realism. There are assessments of failures as well as the many successes. There is also acknowledgment of the almost impossible pressures that communities may come under, which can tip responses towards a level of violence that those in power may actually welcome. This theme bridges the two works. A Guide to Civil Resistance and Popular Protest in Palestine share an outlook, and reading each in light of the other leaves the reader with some optimism. For if the current situation in Palestine is grim in the extreme, the compendium shows that in a striking range of examples, non-violent social changed has actually worked. Even now, for all that events in Israel and Palestine are often so disheartening, there are people working consistently for non-violent change, drawing on rich historical and practical experience to make it possible. That is a message which enables us to have a wider perspective in difficult times – and perhaps even to retain a measure of hope.